Time... I've been passing time watching trains go by... All of my life... lying on the sands watching sea birds fly... hehe you must have sang along with me on that bit huh? Well guess what, the lone woman who made that song as wonderful and classy as it is is coming back to Manila by storm! 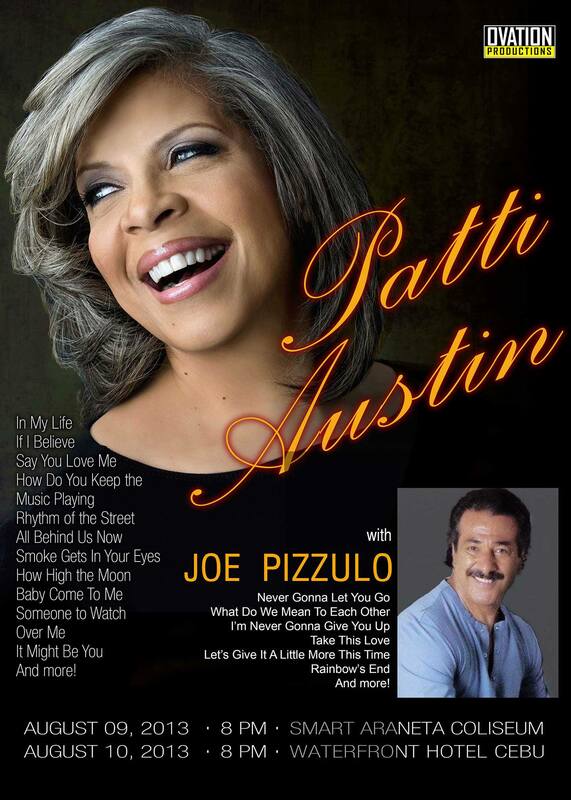 Yes it's Patti Austin and she's coming with Joe Pizzulo. I can just imagine how this concert will turn out oh the 80's are just but a dream... and now it's all coming true! Patti Austin will again sing to you favorites like "In My Life", "If I believe", "It Might Be You" and many more! Joe Pizzulo the former front man of Sergio Mendes in the 80's will get you fall in love again with "Never Gonna Let You Go", "What do we mean to each other", and my personal favorite "Take This Love". The memories just keeps crashing back to me! The Patti Austin Philippine Tour 2013 will happen on August 9, 2013 8PM at the Smart Araneta Coliseum and also on August 10, 2013 8PM at the Waterfront Hotel in Cebu. For tickets and reservations, please stay tuned for announcements, prices at http://www.ovationproductionsmanila.com. Or you can like their page on Facebook!